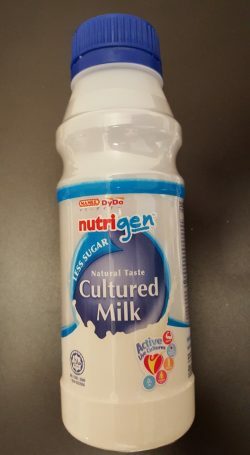 Nutrigen cultured milk drink (300g) now comes with a new packaging design and a low sugar option. The new design with a brand new Mamee DyDo logo reflects the recent changes in ownership following the partnership with Japan’s DyDo Drinco. The low sugar variant comes with a blue colour scheme to differentiate it from the original, which has a red colour scheme. 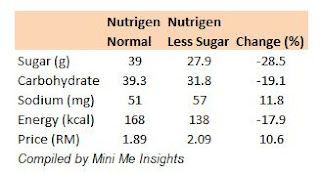 As for the new low sugar option, it contains approximately 30% less sugar and 20% less energy than the original Nutrigen. However, the sodium level is 12% higher than the original one. Personally, I find the less sugar variant has a more sourish taste. 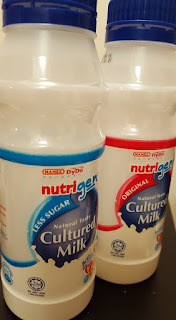 In addition, the price is 11% more expensive than the original, which means sugar-averse consumers have to pay more if they want to enjoy a low sugar Nutrigen.